Wine Making - South Africa. One of the growing industries in South Africa is that of wine making. Slowly but surely our wines are becoming known throughout the world and the industry is growing in leaps and bounds. Where fruit farmers once farmed with apples and pears many of them are ripping out their orchards and establishing vineyards. South Africa produces a large variety of red and white natural wines and then also some of the very best fortified wines as well. The question is how do farmers and winemakers who use about 13 cultivars as their main wine making grape get so many different tastes out of these few cultivars. In the cultivars used there are a selection of white and red grapes and all of these grapes produce a white juice when pressed. White juice out of red grapes I hear someone asking. Squeeze a red grape and see for yourself. The juice is white. So, how do the farmers get the colour into the wines? Once the red grapes have been pressed and the juce is pumped into the fermentation tanks the skins are left in the tank for a period of time depending on what type of wine is planned. If its a Rose' wine then the skins are taken out after a number of hours. If its a medium body red wine the skins are left in for a number of days and then removed. A full bodied red wine is made with the skins being left in the fermentation tanks until such time as the fermentation process is complete. All red wines in South Africa are produced as dry wines. This means that the sugar in the grapes is turned into alcohol by the fermentation process and so the wines become sour or dry to the taste. Winemakers use a Balling meter to test the sugar content of grapes in the vineyard and normally harvest the red wine grapes when the reading is about 18. This means that grapes are not completely ripe and that there is not a lot of sugar in the juice. White wines are produced in more or less the same manner as the red wines. The major difference is that the skins are not used in the process of making white wines. The same Balling tests are used on the grapes in the vineyards and to get sweeter white wines the grapes are firstly left to ripen on the vines and are harvested later than the grapes used in red wines. This means that the sugar content in the grape is higher when harvested about 30 on the Balling meter. Once the wine is in the fermentation tanks a sweeter wine is allowed only a short time to ferment so that not all the sugar is turned into alcohol whereas in a dry wine such as a riesling the process is allowed to continue until the end of the fermentation process. By manipulating the various processes that wine making encompasses the winemaker is able to produce a whole variety of different wines from a single cultivar of grape. When different cultivars of grapes are blended an even greater variety of tastes and flavours can be produced. 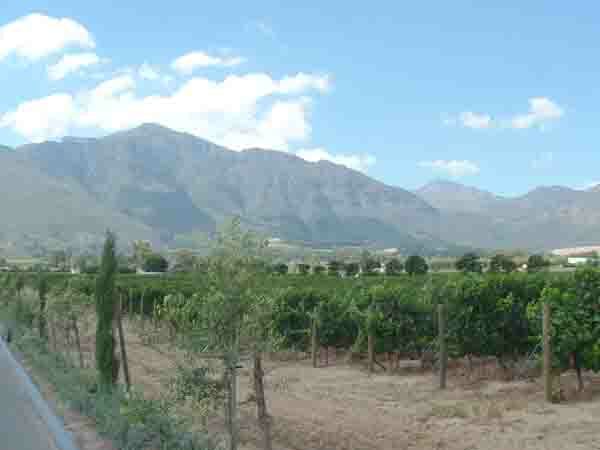 In this article I hope I have stimulated your interest in wines and especially the wines produced here in South Africa. Next time you visit Cape Town do take a cellar tour through one of our many wine producing farms and find out more about this very interesting industry. Cape Town will be proud to welcome you.